The best way to explore Lancaster is with a reliable car hire and VroomVroomVroom can help you find the perfect ride by comparing deals from trusted brands, including Avis, Budget, Enterprise, Europcar and Hertz. We display available hire cars and rates based on the search details you enter on our site. 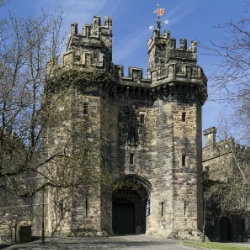 Lancaster or the City of Lancaster is located within the ceremonial county of Lancashire, England, United Kingdom. The city is famous for its large collection of Georgian and Victorian architectures, shopping destinations and gastronomy. To help you get around Lancaster and its nearby towns like Morecambe , start hiring a car now. User-friendly booking engine: We made it easy to compare and book rental cars. Click here to see the steps. Lowest price guaranteed: We have negotiated with our suppliers so we can provide the lowest rates. Read our Price Promise for more details. Free to book: You wouldn't have to pay a booking fee when you rent a car or van through us. Free to modify and cancel: We also don't charge any modification or cancellation fees because we know that plans do change sometimes. Excellent customer care: If you need some assistance in booking a car hire in Lancaster, feel free to contact us via email, phone call, or live chat. More vehicle options: Aside from rental cars, we also compare campervan rentals in Lancashire so you can enjoy your holiday in Lancaster. Convenience: If you are flying to Lancaster via Blackpool International Airport, you can also book a car hire there. The temperate climate of Lancaster makes it an ideal place to visit all year round. It rarely experiences extreme weather changes so even if it is summer and winter, it never gets too hot nor too cold. If you plan to go camping or exploring the wilderness, the best time to visit is April which is the driest month in Lancaster. Avoid travelling in October due to frequent rains. Just like any city in the UK, the weather is unpredictable so make sure to always bring waterproof coats, hats or umbrella to protect yourself from the rain and wind. If you want to know what's happening in Lancaster, click here for a list of events and activities. If it is your first time to drive in the UK, it is important to know that the National Speed Limit for cars and motorcycles is 60mph on single-carraigeway roads and 70mph on dual-carriageways and motorways. Are you planning to overtake? Make sure to do it on the right side of the road. Passing on the left side isn't only dangerous but could get you in trouble with the law. There are several parking spaces in Lancaster and you can even opt for cashless parking. Check out RingGo for more details on that. Before you hop in your car hire or campervan hire, check out the live traffic updates from BBC so you will know which route to take. Click here for more driving tips. Because of its convenient location, most people from London visit this place more than anywhere else in England. No wonder it earned the nickname "the hanging town." If you are planning to hang out in Lancaster, here are some places that you should definitely check out. The Butterfly House in Williamson Park is a wonderful piece of paradise everyone must not miss. Aside from the colourful butterflies, amongst the venue's famous attractions include the tropical birds, fish, trees, and flowers. This historic castle stands on the Castle Parade. This medieval castle is also the oldest building in the city. It is famous for its architectural style, interior design and the roles that it played throughout time. The Dukes offers a cinema, gallery and a number of courses for young people all in one place. It is located along Moor Lane in Lancaster. The theatre can be found at St. Leonardgate and its history dates back 1782. The charming theatre features wide range of performances throughout the year like comedy, drama, musicals and plays. Their mission is quite simple - to produce excellent quality beer through diligently sourcing the finest natural ingredients whilst presenting our product in a modern and stylish way. Cask ale brewing is one of the few quintessentially British manufacturing sectors that is still thriving today. The qualities of Lancaster Brewery combine a number of attributes synonymous with the county of Lancashire – hard work, diligence, innovation and courage. This famous landmark sits along Meeting House Lane and the estate's gardens are open for public all day. As for its historical building that has long been serving the Quakers as a place of worship, it is open for worship two times a week and everyone is invited. Avis Lancaster - Caton Road, Lancaster, . Budget Bd Budget Lancaster Vans - Caton Road, Lancaster, . Budget Bd Budget Lancaster - Caton Road, Lancaster, . Europcar Lancaster (morecambe) - Unit 3 Freightway, White Lund Ind Estate, Morecambe, . Enterprise Morecambe - Unit 1 Northgate White Lund Industrial Estate, Morecambe, ENG. Hertz Lancaster - C/o Holiday Inn, Caton Road, Lancaster, .